Up until yesterday, everything was perfectly fine in the world of iOS based web browsing. Users who prefer to shy away from the native Safari browser in favor of Google’s sleek mobile Chrome offering were extremely happy, that is until the company decided to push out an update via the App Store that brought more than what users bargained for. The latest Chrome update introduced some long-press based gestures as well as new sharing features and the obligatory bug and security fixes. However, what the release notes neglected to mention was that jailbroken users would pay the price for "security" amendments. Regular Chrome users who also happen to be jailbroken on supported firmware immediately started to notice that the browsing harmony had been disturbed when launching the updated Chrome app, resulting in an almost immediate crash back to the home screen. After some investigation by Jay Freeman and developer Paul Griffin, it has become apparent that Google has introduced some untested jailbreak detection code into Chrome, resulting in installations on jailbroken devices crashing on every launch. Enhanced security is always a good thing in mobile apps, especially ones like Chrome that are primarily used for web-browsing. However, even the most security conscious would agree that crashing and not letting us even use the app is going a little too far. The problem with the app seems to occur in the actual jailbreak detection logic that has been included in the latest version of Chrome. The code automatically assumes that users have agreed to send usage data back to Google, whereas in reality; it is actually turned off by default. There is no perfect fix for the issue at the moment. It’s highly likely that we will see a update hitting the App Store soon that resolves the issue, as confirmed by Google here, but in the meantime affected users are faced with the reality of having to allow Chrome to ‘Send Usage Data’. In addition to that, it is also being suggested that all third-party Chrome based Cydia tweaks should be removed in the interim period. Follow the simple steps below to enable the usage data feedback options to allow Chrome to function again. Step 1: Launch the Google Chrome for iOS app. 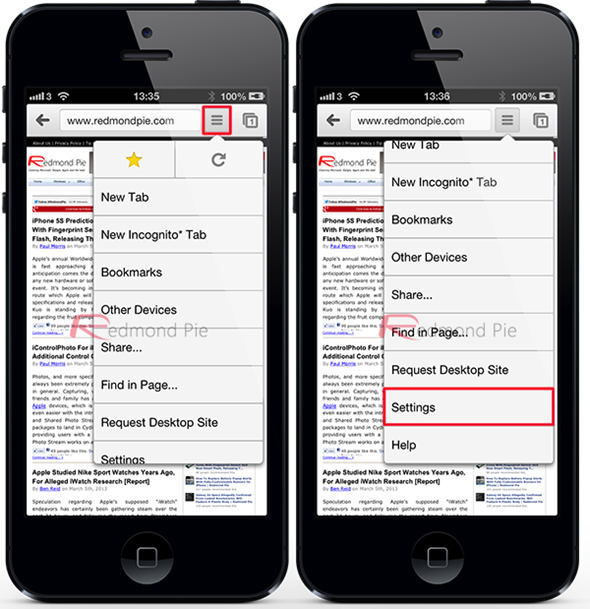 Step 2: When the app has launched, select the Menu button that is located immediately on the right hand side of the omnibox before selecting the Settings option. 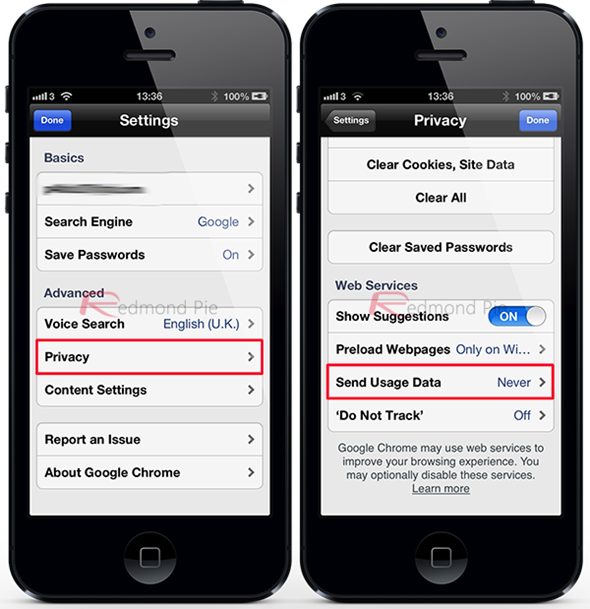 Step 3: Scroll down and select the Privacy option under the Advanced heading. Select Send Usage Data from the new view. Step 4: Make sure that either Always or Only on Wi-Fi is selected from the list. The above steps need to be performed quickly before Chrome crashes again. Alternatively, there is also a tweak that is being offered on a private Cydia repository that gets around the crashing issue without having to allow Chrome to send usage data back to Google. The Chrome Crash Fix package is available as a free-of-charge download from the HASHBANG Productions repository and will fix the crashing issue. Step 1: Launch Cydia, navigate to Manage and select the Sources Option. Tap Edit and then Add before entering the repo specific address of http://hbang.ws to gain access to the packages. Step 2: When the repo has refreshed, download and install the Chrome Crash Fix package to resolve the crashing issue. If the two methods illustrated above don’t work for you, deleting the app and installing it again, this time choosing to send usage data to Google on the launch seems to have fixed the issue for most.